The Patent Lawyer asks about his plans for the Institute and how he sees the role of Mexico in the international IP community. What role were you working in prior to taking up the post? Concerning my professional experience, I have more than 22 years in the field of intellectual property. During this time I was an intellectual property litigant lawyer and I have collaborated with many associations related with industrial and intellectual property, among them the Mexican Association for Intellectual Property Protection (AMMPI in Spanish), of which I became president, the Mexican’s Bar College of Lawyers, the International Trademarks Associations (INTA in English), the Intellectual Property Inter-American Association (ASIPI in Spanish), the European Communities Trademark Association (ECTA), the International Association for Intellectual Property Protection (AIPPI in Spanish); in addition the American Chamber of Commerce of Mexico Intellectual Property Rights Committee Vice-presidency and spokesman. 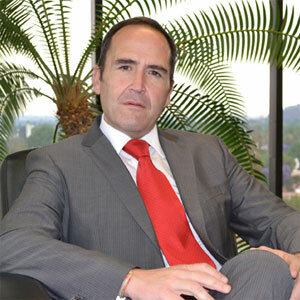 From January 2, 2013 I was appointed by President Enrique Peña Nieto and by Secretary of the Economy Ildelfonso Guajardo as Director General of the Mexican Institute of Industrial Property (IMPI). At the same time, and convinced that education is fundamental for society’s growth and development, I have been professor of Intellectual Property Right in the Universidad Panamericana (Pan-American University), as well in the Instituto Tecnológico Autónomo de México (Autonomous Technological Institute of Mexico). Is your appointment for a set time period? If yes, for how long? IMPI´s Director General appointment, by which I have been honored, has no time limit. I will be head of this Institute for the time the President of Mexico and the Economy Secretary consider me useful to conduct this magnificent institution. To work in order to build a more solid and efficient Institute, that protects and guaranties in a legal manner industrial property rights. As IMPI´s head I will look forward to consolidating a balance between the promotion of patents, trademarks registration and intellectual property protection and fighting piracy. That is, in the years to come the Institute will have, on the one side, a greater role in fighting piracy and unfair competition that so much damages society, and on the other, it will encourage an active participation in Mexico’s innovation system, favoring the technical updating of business. In this resides the importance of increasing Mexican patenting levels and making the Institutes’ services more efficient to the users. Many of the economic indicators tell you that the patentability that a country has is a product of its scientific, inventive and technological development. What do you hope to achieve in your time as Director General? One of the Mexican Institute of Industrial Property six-year presidential term of office goals is to promote the development of Mexican patents. For example, in 2012, 8.3% of the 15,093 filed applications were from nationals, while the remaining applications were from foreign organizations and individuals. This figure increased slightly from 2011, when only 7.5% of the 14,055 patent applications filed were from Mexicans, in other words 1,065 were filed by nationals and 12,990 by foreign organizations. From this, one of the actions will be to promote and contribute so that inventors, designers and businessmen obtain protected industrial property rights; which, in turn with a greater support of research from the Federal Government, will foster better results. Likewise, I will stress the way to speed up and make more efficient the procedures at IMPI using electronic means. In October 2012, online filing of trademarks applications began, contributing to their simplification. As a result of this new tool, 1,261 trademark register applications were received, of which 803 registers were granted in approximately two and a half months. This is half the 4 to 6 months that it would take if the registrations were filed in the traditional way. On the other hand, on February 19, the Madrid Protocol entered into force, a treaty that was signed the previous year and Mexico deposited before the World Intellectual Property Organization (WIPO), in Geneva, Switzerland, to make way for the international registration of trademarks in all those countries that are members, by filing just one application in correspondence with applicable national norms, regulations and practices. It is important to mention, that since November it is possible to file online industrial design applications, and that from January to December 2012 the IMPI reached the amount of 4,080 online filings; of which 1,912 were from Mexican nationals. In fact, we are assessing a way to speed up the electronic procedures an answer to the market demand. We are evaluating the “feasibility” that patent applications could be filed through the internet, considering we are dealing with complex procedures. Another of the lines in which we are working in this administration, is a reform project to change the Industrial Property Law. The aim, besides achieving more appellations of origin, like the Tequila, is that we can have more geographical indications that have to do with the geographical origin and quality of a product. Finally, another of the challenges is fighting piracy, which is a serious problem and in spite of having acted intensely already, we have to continue fighting from our trench jointly with institutions like the Republic’s General Attorney, the National Institute of Copyrights, the Tax Administrative Service and the Customs General Administration, among others. This fight is important in order to guarantee a culture of legality and respect of intellectual property rights. That is, fighting piracy is a joint effort and prevention through awareness campaigns in which the public sector, the private sector and the social sector all participate. There is a National Agreement against Piracy, where all the actors involved, are committed (within our abilities and activities) to work and eradicate unfair and illegal competitiveness. How would you describe the patent protection regime in Mexico? Mexico’s patent regime is aligned with international agreements, so the same protection is offered like in any other country. The procedures for granting patents and registration of utility models and industrial designs are efficient, fast and of quality, which is worldwide accepted by the positioning of the Institute as one of the 20 top offices in the world. How do you see the role of patents in the Mexican economy? The big companies know the added value that patents produce, however IMPI has found the same understanding can be lacking with small and medium business, as well as with researches and the academies in order to disseminate the importance of protecting their developments and research through patents. That is why it’s of the utmost importance to continue the patenting plan initiated last year, by which IMPI left the office and got close to the research centers. There is still work to do, but we are on the right track. The public must understand that patents reflect the state of a country’s development and are of vital importance to increasing the number of Mexican patents. What do you see Mexico’s main role as being internationally in relation to IP? Mexico plays an important international role, promoting the use, modernization, convergence and protection of industrial property (IP). As an example, the IMPI participates actively in different international forums, like the World Intellectual Property Organization, the World Trade Organization ADPICS Committees, the Organization for Economic Cooperation and Development, the Criminal Police International Organization (INTERPOL) and the Asia-Pacific Economic Cooperation, whose group of Experts on Intellectual Property is presided over by Mexico since 2010, having been reelected in one occasion for the biennial 2013-2014. Likewise, Mexico has positioned itself as a referent in the world, mainly in Latin America, on account that it has signed fourteen (14) Free Trade Agreements, which contain Intellectual Property chapters that include the recognition of our appellations of origin. The same way, since October 8, 2012, Mexico takes part in negotiations concerning the Transpacific Association Agreement (TPP), which will renew the intellectual property’s paradigm from an international point of view, setting the bases to establish a better protection and at the same time, encourage innovation, growth and economic development in the member states. In addition, last year on November 19, Mexico signed the Protocol concerning the Madrid Arrangement for the international registrations of trademarks, which establishes a procedure by which with the filing of one international application, the holder of a trademark can obtain its registration and protection in the rest of the Protocol members, with strict compliance of the national applicable norms, regulations and practices. With this measure, Mexico, by the size of its economy and by the use of the trademark system in Spanish, practically consolidates its entrance to the Madrid System. In addition and with the aim of keeping Mexico’s position as a key point in the region, IMPI continues to extend its cooperation activities; an example of this is CADOPAT that is a friendly system with no cost for the offices that use it, by which the patent exam procedure is carried out and turns out fast results to the Industrial Property Office that operates it. This system, managed to date by IMPI, offers the service to 30 industrial property offices of Latin America and the Intellectual Property African Regional Organization (ARIPO). The IMPI has also signed four Patent Prosecution Highway Agreements, in which the mutual recognition of the carried out exams by the first filing office, increases the speed of granting a patent, with the United States Patent and Trademark Office, the Japanese Patent Office, the Spanish Patent and Trademark Office and the Intellectual Property Korean Office. In the months to come, a similar agreement will be signed with the Intellectual Property State Office of the Popular Republic of China. Finally, we find ourselves negotiating similar agreements with the offices in charge of intellectual property matters in Norway and the United Kingdom. Also, IMPI has subscribed twenty six (26) memorandums of understanding on industrial property, by which Mexico maintains close cooperation ties with diverse world offices. In conclusion, Mexico is found at the international forefront; however, the IMPI will continue working strongly to position Mexico as an internationally relevant actor in IP. Argentina, Brazil, Canada, Chile, China, Colombia, South Korea, Cuba, Ecuador, Egipt, Spain, France, Honduras, Japan, Paraguay, United Kingdom, Domenican Republic, Russia, Uruguay, ARIPO, WIPO (3) , OAMI, ASIPI and the Franklin Pierce Law Center.